API Links is a monthly e-newsletter to help keep parents, professionals, and others abreast of the latest news and research in Attachment Parenting and updates of API programs. Anyone can receive API Links! Click here to subscribe. "Toddle About" magazine in the UK covers some of the controversy of Attachment Parenting - AP may not be what you think it is - in its just-released Spring issue. Check out page 17, and the entire issue! 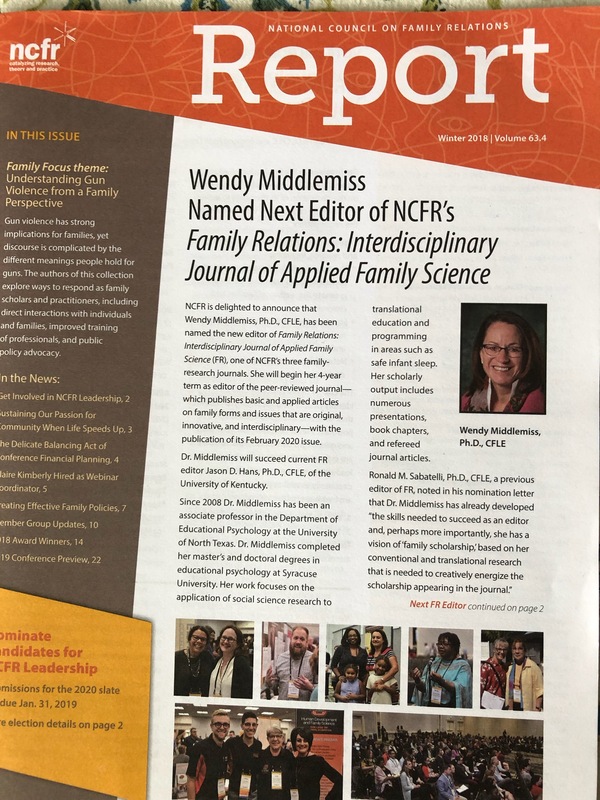 "The National Council on Family Relations (NCFR) is delighted to announce that Wendy Middlemiss, Ph.D., CFLE, has been named the new editor of Family Relations: Interdisciplinary Journal of Applied Family Science (FR), one of NCFR’s three family-research journals. She will begin her four-year term as editor of the peer-reviewed journal — which publishes basic and applied articles on family forms and issues that are original, innovative, and interdisciplinary — with the publication of its February 2020 issue." "That parent who puts their child in front of one of those fraudulent “learning DVDs” isn’t being lazy — they’re worried they won’t get it right for their kid. This issue of a “skills gap” isn’t unusual"
For the last few days, my son has been hunched over an application for a summer program at NASA. I’ve been helping him, shoulder to shoulder, when he needs it, and I find myself staring at him when he’s not looking. It's his junior year, and he'll soon be filling out college applications. My son was "that" kid. The one who shrieked in anguish when another child got the green cup. The one who hid under the table screaming with his hands over his ears when party-goers sang “Happy Birthday.” The one who completely disrobed when a drop of water touched his clothes. The one who yanked the dump truck out of the hands of an unfamiliar toddler at the park sandbox. He was also the one who had hour-long meltdowns several times a day … every day … for months, sometimes until he’d lose his voice. He was the one who would wake with night terrors about being abandoned in the woods, even though I was sleeping next to him. He could have been the poster child for "The Spirited Child. All I can think of is the hours upon hours of holding, rocking, singing, carrying, cosleeping, and loving that my husband and I did - thousands of hours. I gave him Kangaroo Care for four hours at a time in the NICU, until they made me put him back in his warmer. I carried him in a baby backpack as soon as he could hold his head up while I did housework and made dinner. My husband and I cuddled him through his screams and walked him long into the night. Looking at the beginning of the end. The beginning of his adulthood, as a strong, confident, self-assured man. And the end of the difficulties of a childhood with a rough start, a complicated middle, and a promising finish. Were all those hours of holding, cuddling, and crying together worth it? You bet. I wouldn't trade a minute of it. API's Attached Family magazine--out now--explores what "Loving Uniquely," was for us and is for many families, along with many other parenting topics, in the latest issue. Will I be sad to see him go off to NASA (if he gets in) and then to college? Sure. But that’s what we work toward, right? I stare at the back of his head, with his ginger hair, and he speaks to me in his dad's voice. "Mom, do you think this is good enough?" Oh yeah, I do. And then some, kid. And then some. Please welcome Amanda Kail of API of Portland, Oregon, as our newest API Leader. Welcome, Amanda! Please let us know what you like and what could be better about Links - contact us at apilinks@attachmentparenting.org. You can forward this enews to a friend. API is a free enewsletter, dedicated to bringing you information to support you in your parenting journey. Thank You for Celebrating AP Month 2013 "Parenting Creatively" with Us! Are You Feeling Creative Yet? As your holiday to-do list undoubtedly begins to grow, we hope that AP Month this year has stretched your relaxation muscles and enabled you to prepare for and remedy stress in a whole new way. Think of AP Month as a 31-day practice run - a warm up - to building resources, tips, and support to access your own personal ways to creativity year round. Reduce your stress by plugging into all of the accumulated tips and wisdom stored at AP Month Central. See the messages from the AP community in acknowledgment and appreciation for all our volunteers do for families. Thank you to all the API volunteers, from 1994 to today! Support the mission of API and connect with your target audience. to help you create an advertising package to fit your message and budget. API is proactively engaged with organizations with diverse missions and activities in order to leverage and expand our work in supporting all parents, children and families to promote secure attachments and strong, positive relationships. Want to Change a Life? Did You Have an Aha! Moment Reading One of These Links? If so, we couldn't be more pleased to serve you. Help us serve others too. Please consider donating $20, $10, or even $5. API is a non-profit organization and it depends on your tax-deductible donations. Photos by Eden, Janine, and Jim (edenpictures) from here and Pen Waggener from here.